The Georgian Era, a period that lasted from 1714 to 1830, under the reign of King George I, George II, George III and George IV, was a period of progressive social and political changes. The English society was changing at a rapid rate because of the scientific and technological developments that resulted in further improvements in the life of common people. In spite of these changes, there were many other aspects of English society during the Georgian Era that were quite traditional in nature. Dancing was one such social activity that neither changed in terms of style or popularity despite the many other massive changes in the social front. Dancing was an activity of great social value in England for a long time before the Georgian Era. The English society had specific roles for people that were not only allotted on the basis of social class, but also on the basis of gender. Even the occupations that required both males and females to participate, which were very few in number, were taken up by members of one family. Due to the strict gender roles in society, it was not possible for men and women to interact with each other and display their romantic interests. As a result, dances became a very important part of the social life of people. Gatherings in ballrooms were the only events when men and women could interact with each other and show their affections for each other. This made dances the only events that bore some potential for a romantic coalition, which means that the people of the Georgian Era were always enthusiastic about a dance. 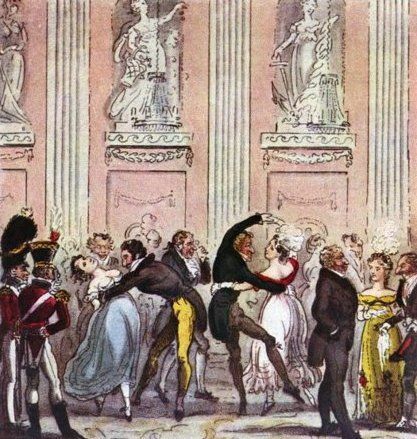 As a result of the great social value of public dances, almost all the major cities of England had dedicated ballrooms which were large halls where dances were organized. The rich people of the upper and middle classes used to gather in these ballrooms for public dances. Bath had some of the most popular ballrooms in the country during the Georgian Era. Because of their great social value, balls and dance parties were important social occasions and hence, there were many strict rules that had to be followed while attending them. The dress code was primary and no person was allowed to enter a ball unless they were properly dressed. Women were expected to wear elaborate gowns and jewelry and men were also supposed to be dressed formally and in a gentlemanly manner. Both men and women were ready to pay a huge amount to carriers of sedan chairs to take them to dances because walking through the dirty streets was not a good option due to the elaborate dresses people wore for dances. Apart from the dress code, it was also mandatory for all to participate in the dances. It meant that all the participants should be able to dance well and it was made sure from an early age. The gentry would appoint dance teachers for their children who would visit them at their homes to provide training. For the rich middle classes, there were dance schools to train them with the intricate steps that comprised of dancing during the Georgian Era. It was highly uncommon for people to introduce their children to the other members of the social community unless they were well trained in the art of dancing. 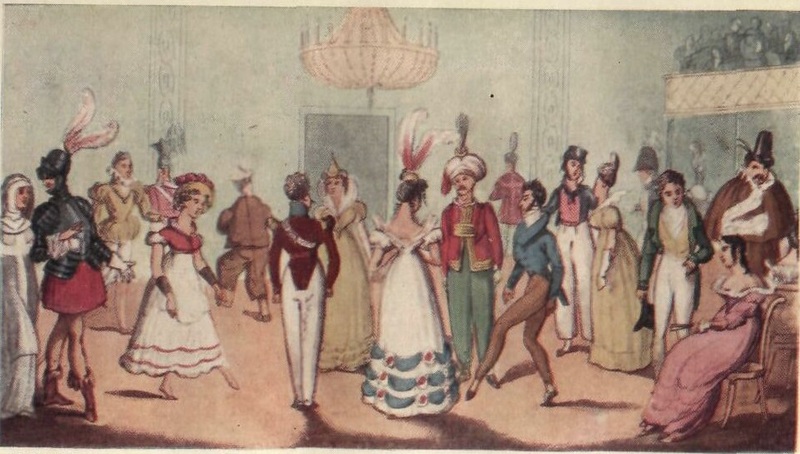 Many popular dance forms were practiced in England in the 18th and 19th century, which had evolved as a result of the interaction and exchange of dancing styles with the French. While most of these dance forms came from France and were adopted by British people, some styles of dancing moved from England to France as well. 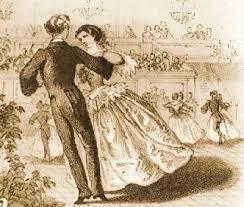 One of the most popular forms of dancing was the English Country Dance. It was a dance form that had originated in England and traveled to France. The dance was performed by men and women together in a large group and each dancer had a partner of the opposite gender. The men and women would start at each side and each couple would come together and lead the group on their turn. It was mandatory for each couple to lead once and the dance would come to an end after each one have had their turn. Another popular dance form was cotillions, which was brought from France to England around 1766. It was performed in a square formation and had a chorus figure that was responsible for leading the dance. During the dance, the chorus could have changed, but it was not mandatory at all. Towards the end of the Georgian Era, Waltz also emerged as a popular dance form. Though it was not accepted initially, it rose to popularity immediately because it allowed a much greater physical contact between men and women, unlike many country dances that were practiced earlier. 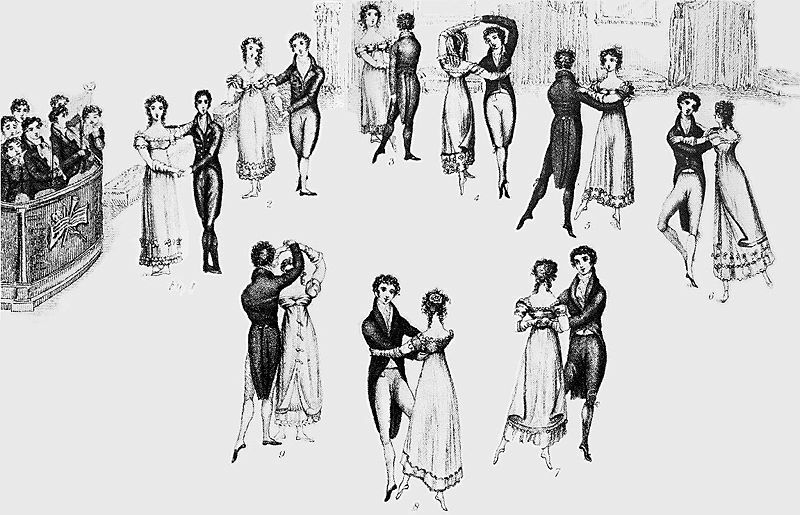 Besides the Waltz, Minuet, Quadrille and Boulanger were also some of the popular dance forms that were practiced by people during the Georgian Era.